I’m starting to get cabin fever. I know, it’s way too early for that. I think it’s mostly due to Edie being home sick 2 days last week with yet another bug going around, that I managed to catch as well. It’s just a mild cold. But the idea that I’ve got another one after the back to back ones that kept me out between Halloween and Christmas has me cranky. Also, I’ve now spent the better part of the last 3 weeks in my tiny, dark house with my family. I love my tiny dark house, I love my family. But enough. Thankfully, the weather was warm this past weekend. 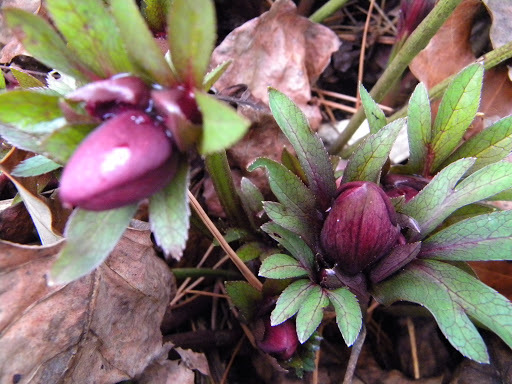 Warm enough I wandered around outside and noticed my hellebore starting to bloom. They aren’t supposed to do this until closer to the end of February. I’d love to regal you with tales of my outdoor adventures this weekend, but not long into my soaking up the sun out there Saturday, I had a run-in with nature. A bird perched itself on a tree branch above me and proceeded to relieve itself, all over my lap. That was enough nature for me for the day. I headed back inside, where I was inspired to do some cleaning – not only did I get the Christmas cookie tins and holiday china packed away, I re-organized the upstairs linen closet. Admittedly, balling up sheets and shoving them in wasn’t working anymore, which is what prompted that bit of organizational madness. Once I got the house clean, I have to admit, I was sort of looking for an excuse to sit and work on my two big projects – Pat’s sweater and the quilt. I’d recently realized I’d made major progress over the holiday break where we sat and watched tv almost incessantly when we weren’t hosting friends. 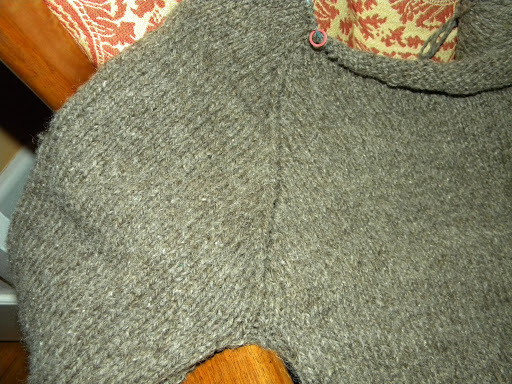 Several inches worth of progress on the sweater. It finally is starting to look like something. Friday night, as I was sitting and ripping out delicate little stitches, I realized I was over halfway done ripping apart the quilt. More like, 75% done disassembling the back from the front. That definitely went faster than I thought it was going to. Both are projects I had pie in sky visions of being done by Pat’s birthday, which is a week from today. The quilt isn’t going to make it – even if I do get the back fully removed, I still have quite a bit of repairs to make to the top of the quilt. It could be an anniversary gift. But the sweater? I think I could make that happen in the next week. 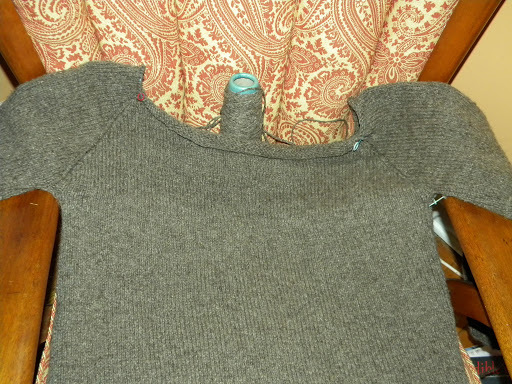 The weather forecast for the week looks conducive to sitting and knitting. And having spent a big chunk of Saturday cleaning, I think I could reasonably pull it off. Ok, this is just legend, but I've heard it said that having a bird relieve itself on you is a sign of major good luck headed your way! Feel better soon! Bummer about the colds –we've had years like that (and still might). It's the one thing I wish someone had warned me about becoming a parent, how you're basically sick all the time for many years. I haven't felt the cabin fever yet, but I know just what you mean. We had some warm days, and then this morning it was 10 degrees out when we left the house! Doesn't it feel good to use the cabin-confined days to get stuff done anyway? Hope you feel 100% well soon.